This theme page includes preschool lesson plans, activities and Interest Learning Center ideas for your Preschool Classroom! Check out the FREE resource download I've put together for your to supplement this theme! Cut pieces of toast and bread and attach pincher type clothespins to each pieces. The children dip it into shallow trays of paint and sponge paint onto paper. Use cookie cutters to dip into paint and press onto paper! EXTENSION: Use clean cookie cutters to cut bread and then toast it after brushing with butter and possibly sprinkling with cinnamon and sugar. Add some baker's hats for the children to wear and add some delivery trucks and other toy trucks to your block area this week! Read this story to the children. Have pictures of each character ready. The children can add them to a flannel board as you tell the story! In advance, collect items used by a baker: cookie cutters, measuring cup, measuring spoon, rolling pin, spatula, etc. Place one of the items in the box without the children seeing what it is. One child feels in the box, without looking, and guesses what it is. Continue until all children have had at least one turn. NOTE: It is helpful to have all the items out and in front of you to show the children and let them touch them as you all discuss what each one is used for before doing this activity! Make different colors of milk in the small cups using the food coloring. The children brush it on and you toast it in the oven. Set your dramatic play area up to be a restaurant. Add a table with tablecloth, chairs and a kitchen area for the chefs to cook! Have all the items they need to serve food: plates, utensils, cups, trays to serve with, etc. Provide clipboards and pens and paper for the servers to take orders. Provide a toy cash register and money as well! The children can help make menus! Ask them what types of food your restaurant will serve. Print the words of the foods and draw a picture next to each so they can "read" the menus! Try using pastry brushes instead of paint brushes this week! Provide bins or baskets and many, many, many, etc. plastic eggs of different colors. Place a color of construction paper in front of each bin or basket. The children toss the correct colors into the correct colored basket. Using plastic eggs and large cooking spoons, the children try to carry a plastic egg from one side of the room to the other using the spoon. I really like this game! It is for non readers! It can be found on Amazon or at toy stores! Use your favorite play dough recipe. Make it with the kids. Have them roll it into snake shapes (they are already good at this!) and make shapes or letters out of it. EXTENSION: In the past, I have made block letters (capital letters) on paper and then laminated them. The children choose a card and shape their dough into that shape by covering the letter that is on the laminated card. Have different types of seeds available for the children to sort into muffin tins or bowls. In advance, print out and color 8 different types of bread. Make 2 of each type. Laminate for durability. The children match, and try to name, the different types. Suggestions: muffin, pretzel, tortilla, pita, cake, loaf, croissant, bagel, etc. In advance, roll playdough into breadsticks of different sizes. Bake. Place then on your math table for the children to sort by size and then put in order from smallest to largest. Themed Music and Movement Activities to Get Your Preschoolers Movin' and Groovin'! Sing this traditional song but replace the word CAKE with BREAD! Bakers man bake me a loaf bread as fast as you can. And put it in the oven for preschool and me! VARIATION: Use the first letter of a child's name (as in the traditional song)--giving time for the child to tell everyone what letter their name begins with--and sing for each child! Put flour in your table this week! Use both white and wheat flour! Add spoons, cups and bowls. EXTENSION: Let the children add salt and water to make playdough!!! Provide a small bottle of hand soap and towels. Place warm water in your table. Let the children practice washing their hands. Remind them that bakers must wash their hands often. EXTENSION: Provide egg beaters, cups and spoons for some measuring and bubble making fun! Add one package of yeast to a cup of warm water. Add in a tablespoon of sugar. Discuss what happens and ask children to explain why yeast is used in bread! Follow this up by making your favorite recipe to make home made bread! Seal one slice in a baggie. Brush water on the top of the other slice and seal in a baggie. Place the bags in a warm place and observe over a week! Materials needed: Magnifying glasses, cups or bowls with different grains. Suggestions: corn, oats, rhy, wheat, etc. EXTENSION: Provide a balance scale and spoons for the children to measure and weigh the grains with. Writing Activity Ideas for Your Bread Theme! Provide each child with a large piece of white construction paper. Let them write on (or stamp or color) their hats. When done, roll into a cylinder shape and tape for a baker's hat! 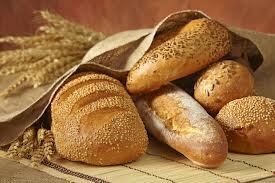 Visit a local bakery or bakery department of your local grocery store! Call ahead to set up a time with the manager! Invite a baker or a family member of one of your student who bakes to come in and cook with the children or to share what they do. They can show the utensils they use and how they work!